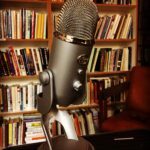 A guest episode in which Kelsey chats with author Dana Fraedrich about books, writing, reading, and being so much cooler than Kelsey could ever hope to be. 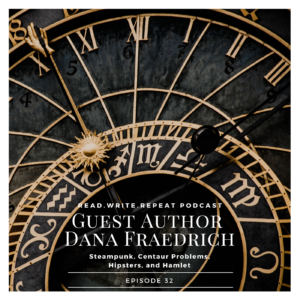 Dana is a super talented fantasy author with a Steampunk series out called Broken Gears. We chat about the steampunk aesthetic and genre and her hipster ways. Dana talks about the role of food in her novels and in her life. We revel in memorable reading experiences and the beauty of Shakespeare. We discuss techniques for covering great distances of time in a narrative and delve into the importance of relatable characters. March’s giveaway is sponsored by author Abigail Shepherd. This month’s winner will receive a digital copy of both of Abi’s books, Victoria’s Victorian Victory and My Year of Stories. To enter, simply follow us on social media and then interact with us or leave us a review! We explain more about how the giveaway works toward the end of the show notes. Dana dislikes useless gears. What are your genre pet peeves, either in the stories you read, or when dressing the part? Let us know in the comments section below, or by tagging us on social media! Your response might be featured in an upcoming show, and you will be entered into our monthly giveaway! Dana’s most memorable reading experience: Ketty Jay, Iron Jackal, hysterical. Dana on the book every writer should read: I think every writer should read older books as well as new ones to see how prose has changed over time (and I think readers need to read these as well, so they learn to be patient readers). I actually think reading a lot of Shakespeare’s work can make people better writers (especially Hamlet and Much Ado About Nothing), but that’s not really accessible for a lot of people, so I’m going to suggest the Harry Potter series instead. I suggest that series because it’s really accessible and does a great job of bringing a lot of seemingly disassociated elements together, plus world-building, characterization, and timelines. What made this story impactful to you as a writer? Every character struggles and has to overcome things that are relatable on a lot of levels – neglect, being poor, racism. And you keep fighting. Is there anything you don’t like about the story? I wish there were more! I want to know more about the world, not just in the UK. What technique does the author use well? I like the time stretches. It doesn’t feel rushed. Dana has a new book coming out soon! It’s a new book in my Broken Gears series, but it’s a standalone story, separate from the story readers have seen so far. Raven’s Cry, Swan Lake retelling wherein we see the history of Invarnis and how we got to where the first two books take place. See Cali’s struggle with loss and the curse, looking for hope and meaning. What inspired it? It started with a historical fiction concept I wrote years go, but I never felt right about, so I let it sit. When I was writing OOTS, I realized this is where Calandra belonged. What were some of the challenges in writing it? Time. Hundreds of years pass, and I don’t want it to feel rushed. Don’t forget to check out Dana’s blog post about writing characters that are relatable to modern audiences. Don’t forget to enter our giveaway! March’s giveaway is sponsored by author Abigail Shepherd. This month’s winner will receive a digital copy of both of Abi’s books: Victoria’s Victorian Victory and My Year of Stories. To enter, simply follow us and tag us in a bookish photo or comment on Instagram, Twitter, or Facebook, or leave us a comment on our show notes!